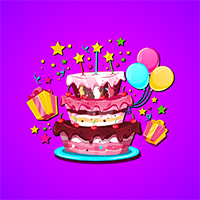 Find New Year Cake is the latest point and click escape game created by aVmGames.com. "It's a piece of cake"- you thought. You left organizing the new year party for the last moment, because you were so sure that it wouldn't take too much effort. Of course it turned out that it's not as you thought. First of all, you can't even find your phone. Maybe it fell behind the bed? No, it's not there... In the bathroom maybe? You also need to write a list to see what should be bought for the party. More importantly, you need to get rid of this mess you have here. Maybe it will hasten things up. Good luck, Have fun!! !